Every so often I stumble upon a game that I immediately know will be one of my all-time favorites. More and more, the games that fall into this category are indie games that only take me a single digit number of hours to clear. Despite being short by video game standards, they manage in this short time to demonstrate the very best gameplay qualities and innovate further within their chosen genre, as well as present a compelling and deep narrative, all along with art and music that link the two together. It seems like a tall order, but back when I started this blog I had just started Bastion and knew instantly that it would forever be one of my favorite games. Later on, Axiom Verge and Undertale joined the list. This week, the new inductee is Celeste. A glowing review from a co-worker convinced me to buy Celeste on Switch (though it is available on most consoles and Steam), and within mere minutes I was loving it. Celeste is a puzzle-platformer with a platforming difficulty level somewhere above Super Mario Bros but well below Super Meat Boy, which puts it right in the sweet spot of challenging but not sadistically punishing. That may intimidate some who aren’t huge platformer fans, but about half of the challenge (and in particular the hardest parts) are purely optional. Strawberries are distributed throughout the levels in hard-to-reach spots that will push your platforming skills to the limit. They’re there if you want to get them, but the game even goes out of its way to let you know that they don’t matter other than that. Strawberries – the hardest way to impress your friends. Seriously. So then what’s the point of the strawberries? Why do I (the player) feel such a gut-level need to at least try to collect them? 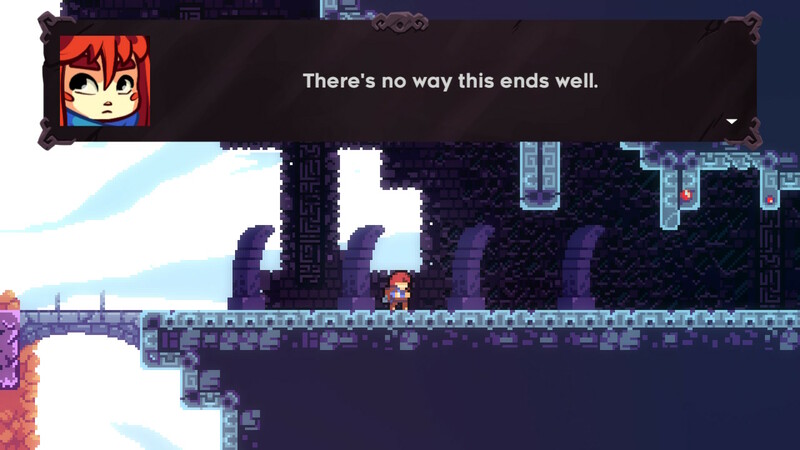 In Celeste, you play a girl named Madeline who is trying to climb the titular Mount Celeste. Along the way you meet a few other characters, including social-media-obsessed fellow climber Theo and a crazy old lady who seems to be more with it than she lets on. At the start, the lady warns you that strange things happen to climbers who attempt to summit the mountain and urges you to turn back. Of course, Madeline stubbornly pushes ahead, insisting to both the lady and herself that she “needs to do this.” It’s only in a later chapter that you meet the reason why – A physical manifestation of Madeline’s mental illnesses (mainly depression and anxiety) who springs from Madeline’s mind in a nightmare and retains physical form even after the sun has risen. The girl (nicknamed “Badeline”, though this name is never used in the game) haunts Madeline at every turn, insulting her and telling her repeatedly to give up. At every success, she urges Madeline to quit while she’s ahead and at every failure trumpets her foresight and warns of even worse consequences if Madeline doesn’t throw in the towel. But Madeline persists, and persists, and persists. There is a very interesting connection between platformers and depression. In any sufficiently difficult platformer, even the best player will “lose” to the game hundreds of times before they eventually succeed by the skin of their teeth. With every successive failure, the game is effectively telling you, “You can’t do this. You’re not good enough. You’ll never be good enough. Quit. Turn the game off. Give up.” I am no expert in anything mental health related, but I wonder if these same feelings of frustration and hopelessness are what people who suffer from depression deal with constantly in their everyday life. If so, the game not only destigmatizes depression but praises those who carry its burden while continuing to push themselves to reach the highest heights. Within the game, continuing to play is telling the game that it is wrong. That after every failure you will try again. That you have the ability to succeed and the fortitude to see it through. The fact that the mechanics and the narrative are intertwined at the deepest of levels really drives this point home. 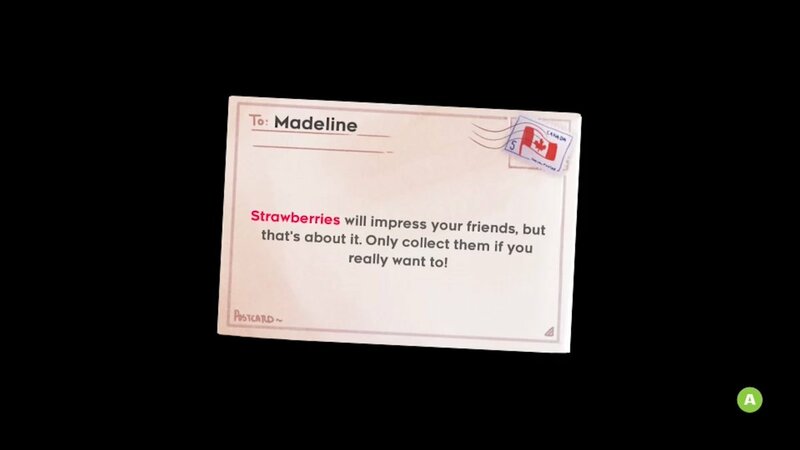 I yearn to collect strawberries just like Madeline yearns to reach the summit of Mount Celeste. Neither poses any reward of any sort, yet the very existence of the mountain (and the strawberries) issues a challenge to any who would dare lay eyes on it. Simply walking by would be admitting defeat, and neither I (the player) nor Madeline the character are ready to give up just yet. Towards these ends, the musical score is truly magical. It seamlessly fits into the mechanics and themes, while also subtly re-asserting the plot throughout the game. For an example, here’s “Scattered and Lost”. Each of the songs blends light acoustic sounds (mainly piano and acoustic percussion) with heavy, dark and dissonant electronic sounds. In a way, this combination symbolizes the state of Madeline’s mind, with the acoustic sounds representing her optimistic and confident personality and the electronic ones representing the weight of her depression. Throughout each of the songs in the soundtrack, these two elements do battle, each vying to gain dominance over the other yet both unable to fully declare victory. The plot of the game, which I won’t spoil here, comes to the same conclusion. One of my favorite parts of games as an art form is that they are able to unlock emotions in the player that other art forms (for example, books, movies, and paintings) struggle with. Platformers excel at causing the emotions of frustration and (in the non-medical sense) depression when the player fails while bestowing elation, confidence, and pride when the player succeeds. Celeste capitalizes on this unique ability of platformers to weave a narrative of challenge and suffering, of rising only to fall and yet still getting back up onto your feet. It instills a deep empathy for Madeline and respect for all who struggle with depression but despite its burden still continue through life. In a way, the very frustration and challenges set up by platformers like Celeste make them the most optimistic and encouraging of games. By setting up challenges they make us better players by allowing us to overcome them. We collect the strawberries because they’re there. We climb the mountain because it’s there. We strive to make tomorrow better than today because that’s what it means to be alive. If the mountain could see our faces at the top, if it could feel our elation and our pride at conquering it, I don’t think it would curse us. I think it would be proud.